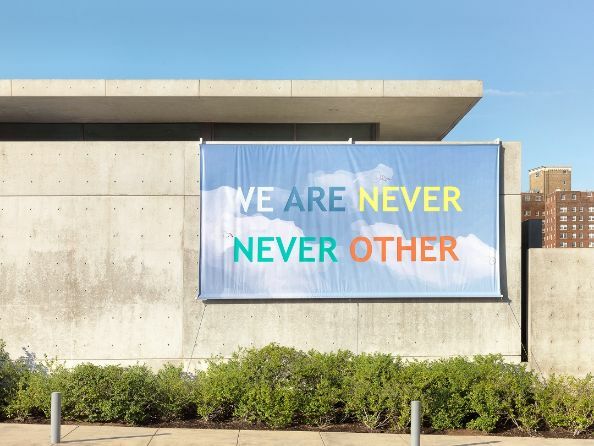 Lecturer and Fiber and Material Studies alum Aram Han Sifuentes (MFA 2013) recently installed a large-scale protest banner We Are Never Never Other on the facade of the Pulitzer Arts Foundation in St. Louis. Sifuentes brought her protest banner to the Pulitzer Arts Foundation earlier this year and offered workshops on creating banners to be added to the library. Examples of other banners can be viewed by searching #protestbannerlendinglibrary via Instagram. The banner she created represents “the voice of the disenfranchised, both calling attention to and standing in defiance of the act of ‘othering,’ or alienating, one another,” and is inspired by social theorist Avery Gordon, who writes, “Complex personhood means that even those called ‘Other’ are never never that.” We Are Never Never Other was commissioned as part of Sifuentes’ artist’s residency and will remain on display through August 31. Sifuentes’ work will also be on display in the coming months at the Museum of Design Atlanta as part of Making Change: The Art and Craft of Activism from June 3–September 9 and at the Ross Art Museum in Delaware, Ohio as part of What We Make through October 17. Adjunct Associate Professor in the Fiber and Material Studies department kg Gnatowski's (MFA 2007) solo exhibition, Some Kind of Duty, was recently reviewed in the Chicago Tribune.